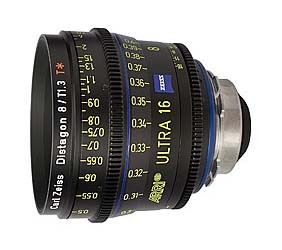 Are you are looking for Super 16 / 2k digital format lenses for sale? click here to see current inventory. This page provides the most complete information available on lenses known to cover the Super 16 format, film or digital. Super 16 is a relatively new format, independently developed in 1969, whereas standard 16mm had been around since 1923. Most vintage 16mm format lenses were designed for the smaller standard 16mm format which has been around since 1923. Optics specifically designed for Super 16 did not begin to appear until the mid to late 1970’s, and the format did not become popular until the 1980’s. The choices in Super 16 optics remained very limited until the early 1990’s. Standard 16mm lenses are designed to cover a minimum image circle of 12.8mm, and Super 16 lenses are designed to cover a minimum image circle of 14.5 mm. This is an increase of 13%. Some lenses designed for standard 16 lenses happen to have have enough coverage to cover Super 16. It is important to consider optical quality. To get the most out of Super 16 film or S16 sized digital imagers, you need top quality optics. Consider that to get the same detail level on a S16 sized sensor as you would on a 35mm sized sensor, you would need double the image resolution. To get full 2k image quality on a Super 16 sized sensor (or S16 film), you need lenses that have significant MTF response at 80 lp/mm. Fortunately most modern Super 16 lenses can deliver level of performance. Incidentally, this is the same level of MTF response you need to get full 4k image quality on a Super 35mm sized sensor or 35mm film. But it is more difficult to find 35mm format lenses, especially wide ones, with significant MTF at 80 lp/mm. Inexpensive low-quality mass-produced still camera optics struggle to have any MTF at 40 lp/mm, less than half what is needed for best quality in the S16/2k digital format. The image diagonal equals the minimum image circle needed from the lens to cover that format. Note that Digital Bolex has a diagonal slightly larger than standard 16mm, so many standard 16mm lenses will cover the Digital Bolex sensor. The Black Magic Pocket Cinema Camera has the same diagonal as full frame Super 16mm film, so Super 16 lenses are required for the BMPCC. – see below – which are compatible with both standard and Super 16 formats. Lenses, prime and zoom, designed for 35mm always cover Super 16. This also includes all lenses designed for 35mm still cameras (Canon, Nikon, Zeiss ZF, etc.). Lenses designed for the Super 16 format will almost always give higher optical quality, at least in the shorter focal lengths (below 50mm). 35mm format lenses may give you other options such as the ability to shoot with vintage 35mm lenses. Vintage lenses also exist for 16mm format, but these frequently don’t cover Super 16 or digital 2k in the wider focal lengths. Please see the optics resources page for in formation on 35mm format lenses. The recent Todd Haynes film Carol was shot on Super 16mm with vintage Cooke Speed Panchro lenses. Not the sharpest lenses for S16 format, but the look they gave worked perfectly for the story. (made by Abakus, no longer available but may still be available used). 4) 16mm zoom lenses with incomplete coverage. These lenses were designed for standard 16mm, but cover Super 16 over part of their zoom range. This can sometimes provide a less costly solution as long as you can live with the drawbacks. The Super-16 format requires an image plane circle at least 13% larger than standard-16. Most zoom lenses designed for standard -16 do not have the required coverage, especially on the wide angle / close focus end. NOTE: All of the lenses mentioned below are discontinued and should be considered vintage lenses. These lenses were either designed for the Super 16 format, and will cover the Super 16 format at all focal lengths and focus settings. These lenses meet today’s standards of optical quality for Super 16 format production. They are all multi-coated and frequently utilize such technologies as low dispersion glass and aspherical elements. Unlike older lenses, it is possible to shoot with these lenses at their maximum aperture “wide open” without a noticeable loss is quality. If you need to shoot with a zoom lens, consider zoom lenses from this chart (or new style 35mm zoom lenses) for your Super 16 cinematography. The lenses in this chart below are older designs that happen to have enough coverage for the larger Super-16 aperture. There are only a few lenses in this category. These lenses do not take advantage of modern technology in glass and thin-film coatings, as do the lenses in the above chart. This means that overall image contrast will be lower, and images will be softer, especially at full aperture. 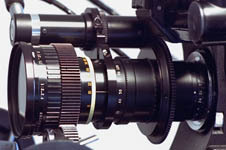 However, lenses that were low in contrast or have less sharpness can sometimes be desirable for digital cinematography if they have pleasing optical signatures such as pleasing bokeh or unique flare characteristics. And these lenses generally perform well when stopped down 2-3 stops from maximum aperture. The definitive lens in this select group is the Angenieux 10x15B 15-150mm T3.1, which was introduced in 1963. This lens is based on the very successful 10x12B 12-120mm T2.5, but with a different rear relay group increasing the focal length 25%. 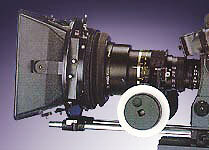 The 10x15B was designed for coverage for 1 inch video tubes, which have a larger image sensing area than Super 16mm film. The 10x15B should cover 16:9 sensors up to 14mm wide. The 10x15B generally performs as well optically as the much more common 10x12B which does not cover Super 16 at all focal lengths. In general, it should be used at T4.5 to T8 for best results. It has a slower maximum aperture of f2.8/T3.1 compared to the 10x 12B. These older lenses are found in c-mount, ARRI Standard mount and ARRI Bayonet mount, as well as less common mounts such as Aaton A40 and CP-16 mount. CinemaTechnic is now offering a high quality PL mount conversion for the Angenieux 10x15B 15-150mm T3.1. The conversion uses industry standard ARRI/Zeiss style PL mounts and uses standard Zeiss shims to facilitate back focus adjustment. Please keep in mind that a lens support is necessary when using a zoom lens on a c-mount camera. Lenses in this second category were designed for standard-16 only. 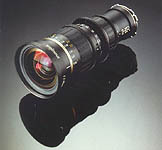 The were among the highest quality zoom lenses for the standard 16mm format. They are converted to Super-16 by using a low-power focal length extender. Similar to the 1.4x extenders and 2.0x extenders (sometimes called doublers) that attach to the rear of many lenses. These lenses have had 1.15x or 1.2x extenders installed behind their rear elements. The 1.2x extender optics increase the diameter of the lens’ image circle by 20% thereby extending coverage to the Super-16 frame. Because the focal length is extended only 1.2x, the loss in optical quality in minimal, compared to 2.0x extenders which typically reduce the MTF of the primary lens by 50% at maximum aperture. 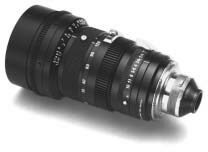 The original Optex conversion kits for the Cooke 9-50mm T2.5 and Zeiss 10-100 T2.0 are discontinued as of 2005. 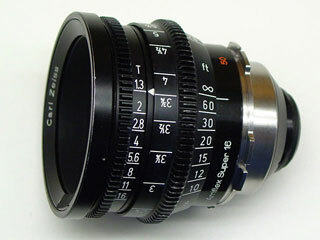 CinemaTechnic can still offer a S16 conversion for the Zeiss 10-100 T2.0 and the Cooke 9-50mm T2.5. Information on Super 16 zoom lens conversions. Zeiss 10-100 T2 Mk. I Super 16 in PL mount, converted by CinemaTechnic – lens becomes 12-120 T2.4. The new conversion optics are integrated into the PL mount cone. The discontinued Optex S16 conversion for the Zeiss 10-100 T2, in bayonet mount. The conversion optics fit into the recess in the Bayonet mount. Lenses in this third category were never designed for Super-16, but owing to their being mostly long focal length designs, the may have a great deal of useful coverage. Their coverage extends over most of the focal length range, but is limited on the wide end, and in the close focus range. The column “Coverage @ Inf.” shows the range of Super-16 coverage when the lens is focused on infinity. The column ” Coverage @ Min.” shows the coverage at minimum focus, which is usually lower. Angenieux 10-120mm T2.0 in Bayonet mount. 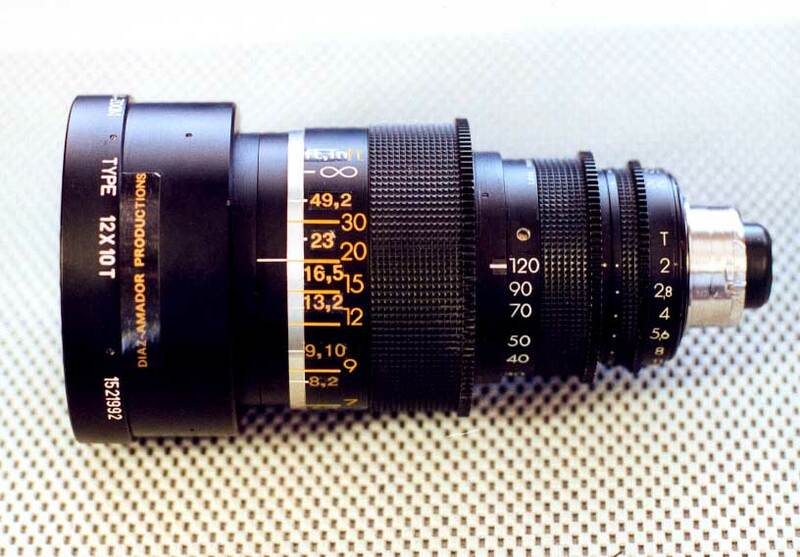 This rare lens was the predecessor of the 11.5-138mm. Of the three zoom listed below, the Angenieux 12x10T 10-120mm T2.0 comes closest to covering Super 16mm at all focal lengths. It also has the highest optical quality of the three. The Angenieux 12-120mm T2.1 HEC is a close second. Both are rare and difficult to find on the used market. Most 16mm prime lenses that were not designed with Super 16 in mind generally do not cover S16 if the focal lengths are below 25mm. Most standard 16mm prime lenses 25mm and above generally have enough coverage (but you must test each lens). The chart below shows the only prime lenses designed specifically for Super-16. Most other 16mm primes were designed for standard-16mm and will not cover Super-16. In terms of technical merits (MTF, distortion, etc) the Zeiss Ultra 16 are the sharpest S16 lenses ever made. Although nominally part of the “Ultra” line, they are all T1.3 and are at least a match for the Zeiss Master Primes. Carl Zeiss technicians have told me that the Ultra 16 are the best technical performance lenses ever made by Carl Zeiss. Due to their high cost and untimely introduction, they were sold in very limited numbers. The films Fruitvale Station (2013), Black Swan (2010) and The Wrestler (2008) were shot in Super 16mm with the Zeiss Ultra 16 lenses. Prototype Cooke SK4 Super 16 Prime Lenses: 9.5mm and 12mm T2.0. Photo captured by the author on an optical table at Cooke Optics Leicester in 2005. Cooke Optics also produced a set of dedicated Super 16 prime lenses to complement the 35mm S4 series, called the Cooke SK4. 6.0, 9.5 and 12mm focal lengths were available, all T2.0 maximum aperture. These lenses have superb optical performance. The SK4 are designed to match the 35mm Cooke S4 series prime lenses. Modern Cooke lenses are known for their very pleasing bokeh and color rendition, called the “Cooke Look”. In general, this means the SK4 will have very high contrast, even wide open, but will have a more subdued rendition of fine details wide open, like the 35mm S4 primes. Think of a high contrast vintage look. When stopped down to medium apertures T2.8 – T5.6 the optical performance of the SK4 lenses is very high and should be a match for just about any other S16 prime lens available. Only the Zeiss Ultra 16 could claim to be sharper. The films Carol (2015) and Return (2011) were shot in Super 16 with Cooke SK4 and S4 lenses. Complete information about the Zeiss Super Speed lenses can be found on our Zeiss Super Speed lens section. The article covers both S16mm and 35mm versions of the lenses and all three generations. 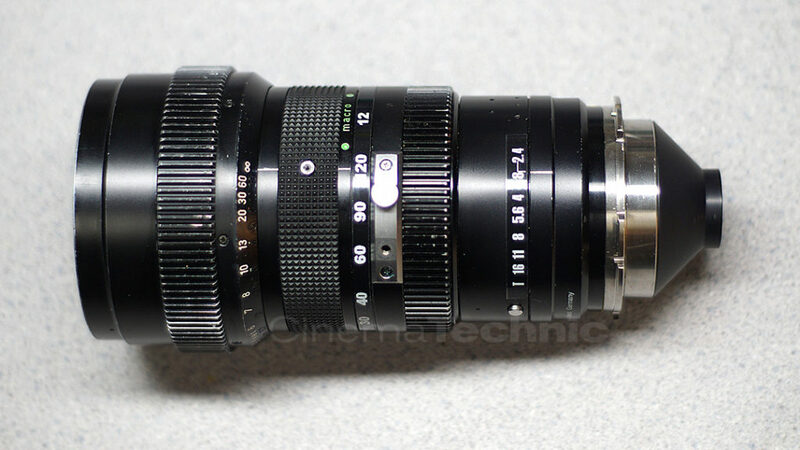 Older model Kinoptic Tegea 5.7mm lenses are f1.8/T2.3. Newer models are T2.0. Focus is fixed, and set to a hyperfocal distance of about 3ft 6in. Depth of field is 19 inches to infinity at T2.3, and 8 in to Inf. at T16. Theses lenses require modification to clear the 16BL/ 16SR mirror shutter. Modification is not necessary for digital Super 16 format cameras. Some older lenses are meant for the Arriflex 16S. The lens mount is one piece with the focus scale and rotates with it (ex. most Cooke Speed Panchos). These lenses will not clear the shutter on a 16BL or 16SR. 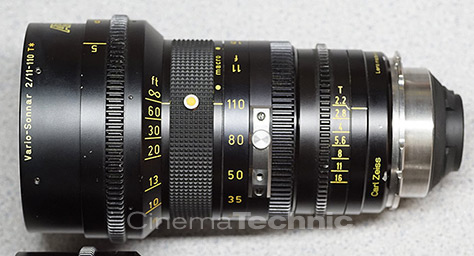 CinemaTechnic can sometimes modify theses lenses for compatibility with the 16BL/SR. These lenses can only be used in a PL mount camera with a special PL mount adapter available from CinemaTechnic and only after being modified. Again, the mirror clearance issues no concern for Digital Super 16. ARRI does not list the Zeiss 9.5mm T1.3 as covering Super 16. This is probably due to the fall off in resolution in the extreme corners of S16 with this lens. Also there is some actual vignetting when stopped down past T11. In my experience, these are not major problems, so I consider the Zeiss 9.5mm to cover Super 16. The Mk.3 version Zeiss Super Speed S16mm format lenses have a focus barrel rotation of 320º (degrees). This is considered the “Extended Focus Scale”. The numbers on the Mk.3 focus scale are also larger and oriented vertically. The Mk.3 scales are in feet or meters only, and are readable from both sides of the camera. Mk.3 lenses have gears on the iris scale ring. The Mk. 2 version Zeiss Super Speed S16 format lenses have a focus barrel rotation of 160º. Numbers on the Mk.2 scale are oriented along the lens axis. There are two scales, one on each side of the barrel, providing both feet and meter distances. The Mk.2 scales have smaller numbers, but more actual focus marks, although they are spaced closer together. It is physically possible for a Mk.3 S16mm format Super Speed to have a Bayonet mount fitted (not possible on the 35mm format Mk.II and Mk.III primes), but you will probably never see one with a Bayonet mount. All Zeiss Super Speed lenses were discontinued in 2004 and the last new lenses were sold by ARRI in 2007.